I finally got to hold a dinner party for some friends here in Fredericksburg. We had drinks (my first Tom Collins, mmm), salad greens tossed with a simple garlic lemon dressing, and Pizza Rustica, the project for Tuesdays with Dorie this week. Four of us sat out in the backyard on a cool Saturday evening, and we all had seconds—only three tiny pieces were left as leftovers for this week! 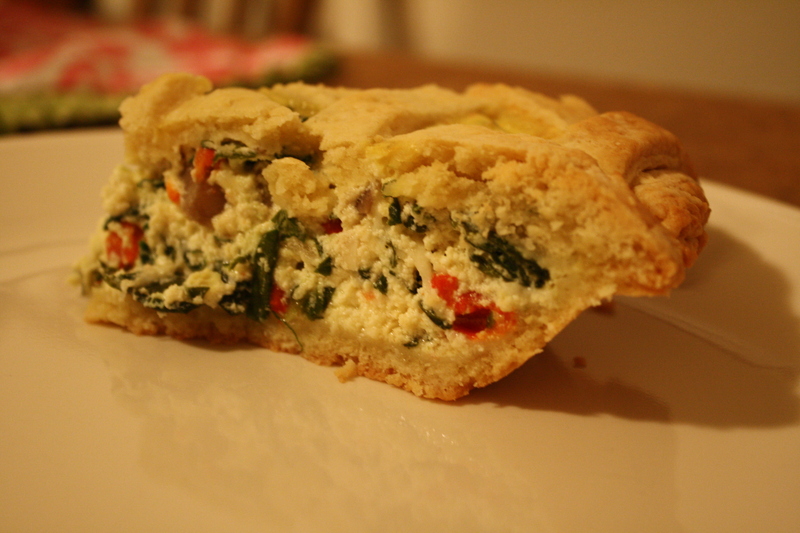 My mom also made Pizza Rustica for their dinner in Roanoke that night. We got to compare notes immediately before, and then the next day. Both of us agreed that it was veryyyy sweet. She’s never been a fan of sweet crusts from some local pizza joints, while I never found them to be a problem. But we both agreed that the sugar in this recipe could be at least halved, if not reduced even more than that, for this recipe from “Baking with Julia.” But besides the sugar, this was a delicious recipe. 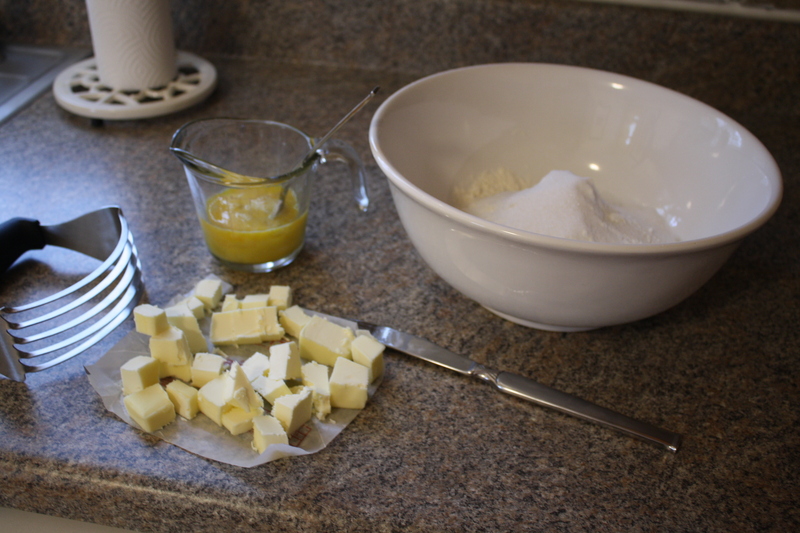 Without a full-size food processor, I had to resort to an old fashioned method to make the dough. 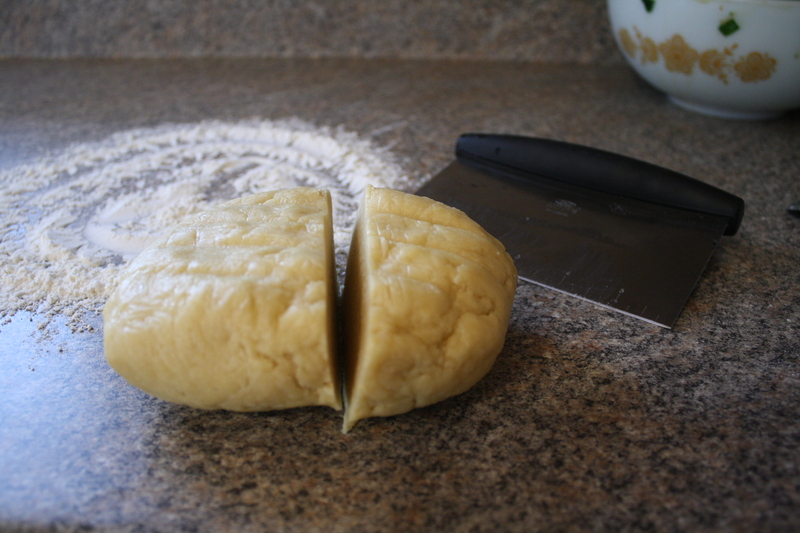 But using a pastry cutter is actually pretty fun! 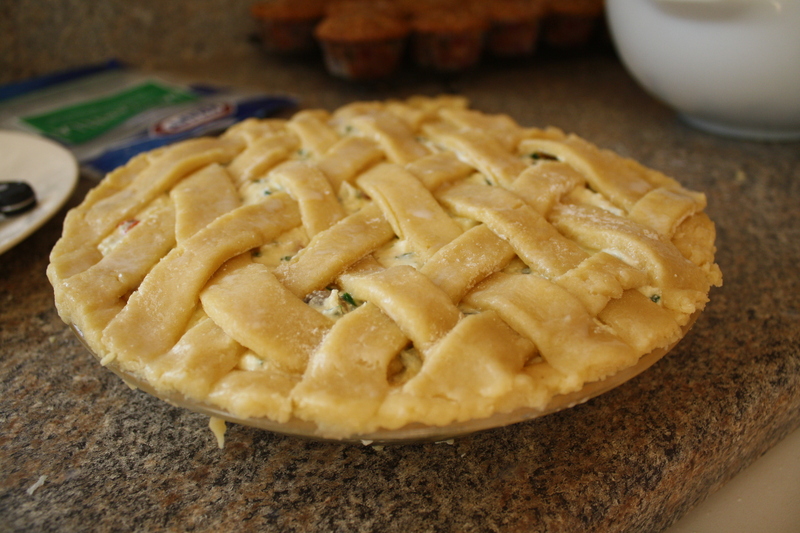 You cut it into two pieces - one is bigger for the bottom crust, and the other is smaller for the top lattice. 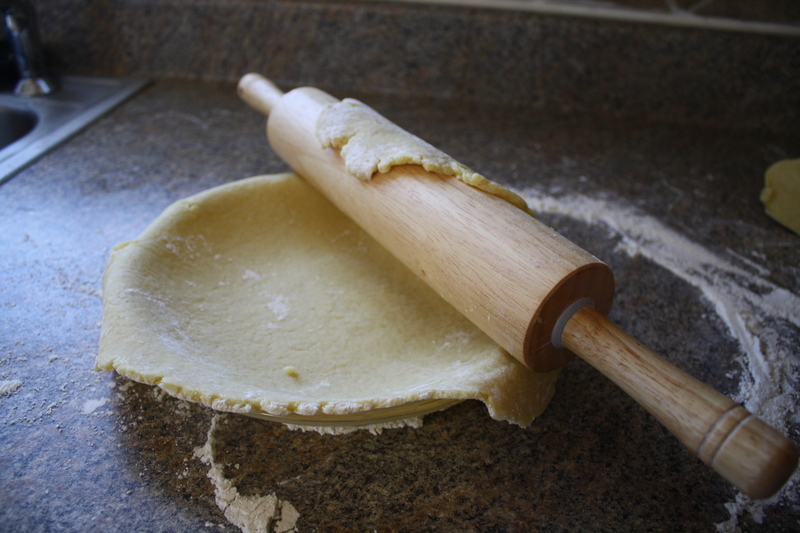 I did that trick where you roll the crust onto a rolling pin and then lay it into a pie plate. Since this crust was relatively thick, it worked out well. 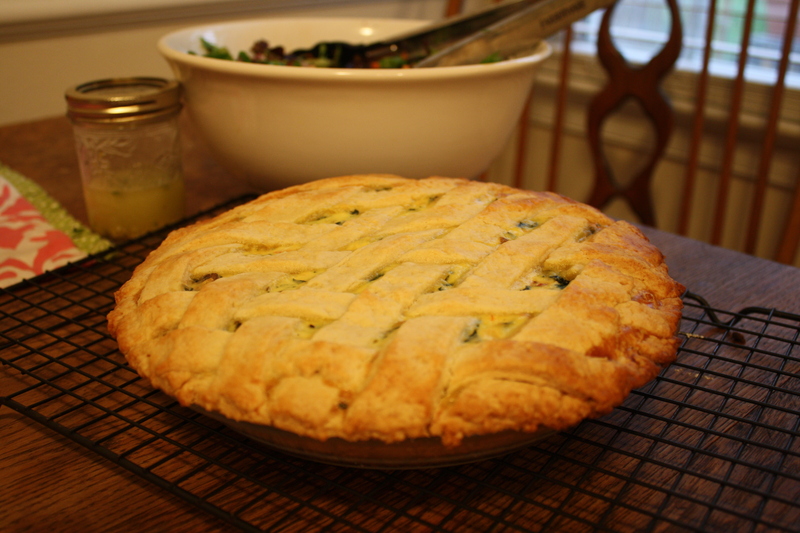 I was worried about weaving the strips of dough to form the top lattice, but it wasn't too hard. You just pull back the pieces as you weave over and under. The dough was simple enough. But the fillings were where things got tricky for some bloggers, it seemed like. Neither of us had much of a problem though. 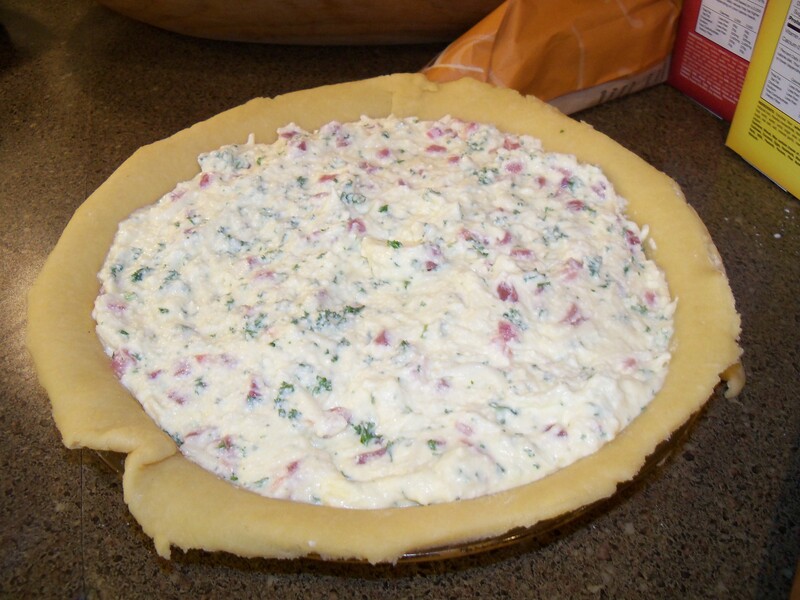 My mom followed the recipe as is—using ricotta, mozzarella, pecorino romano, prosciutto (a dry-cured ham) and parsley. 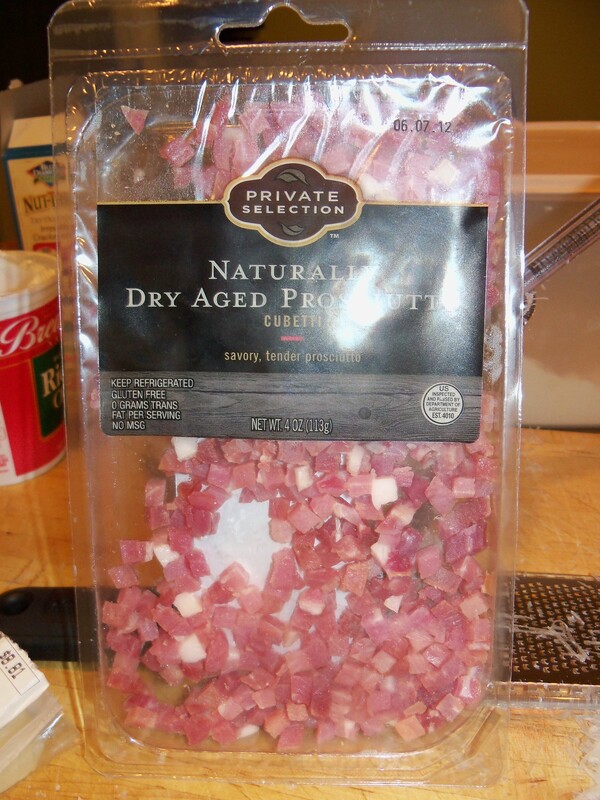 I thought the fact that I almost put in four times the romano was pretty funny. I can’t even imagine what it would have tasted like! I also forgot the pepper, oh well! Daddy and I both liked it pretty well. Had it for lunch today. Daddy thought it was delicious either warm or cold. 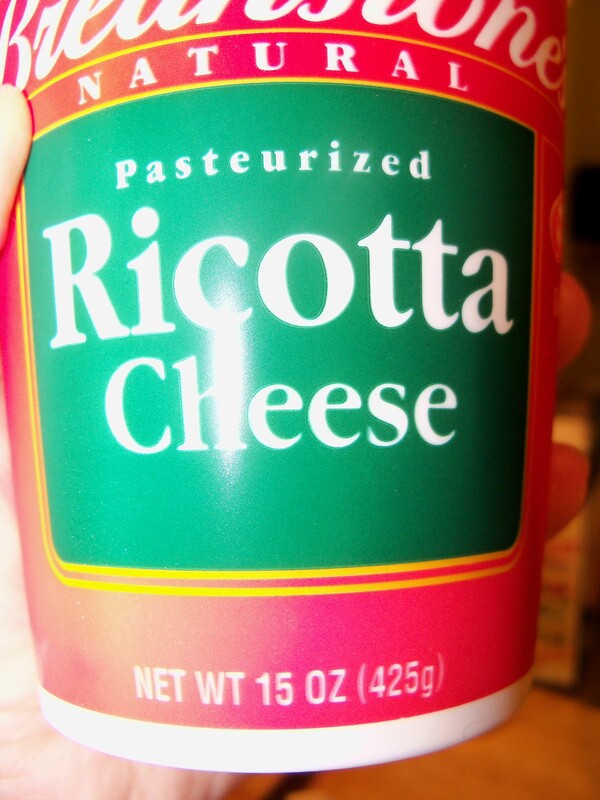 We both used whole milk ricotta, which is thicker than the popular part-skim ricotta, which I have used for stuffed shells in the past. But because you want this filling to set up nicely and not be runny, the extra fat seems like it may be important. 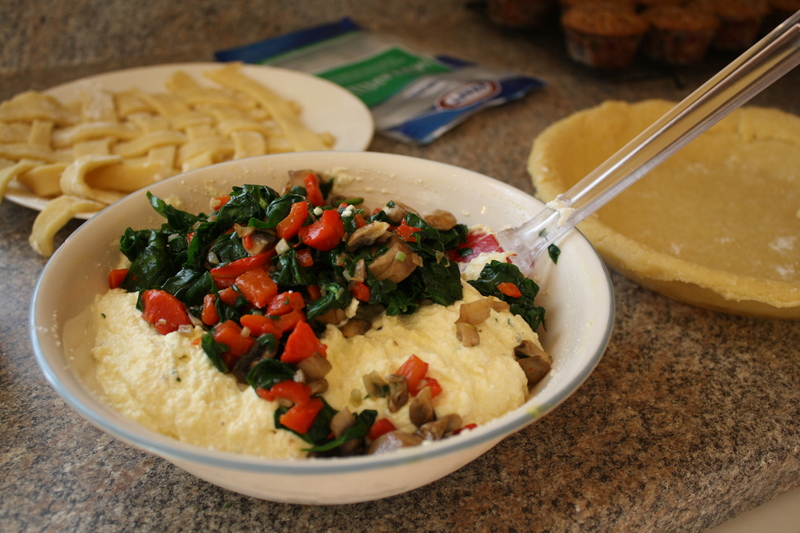 Meanwhile, I used a vegetable filling—of spinach, roasted red peppers (that I made myself! 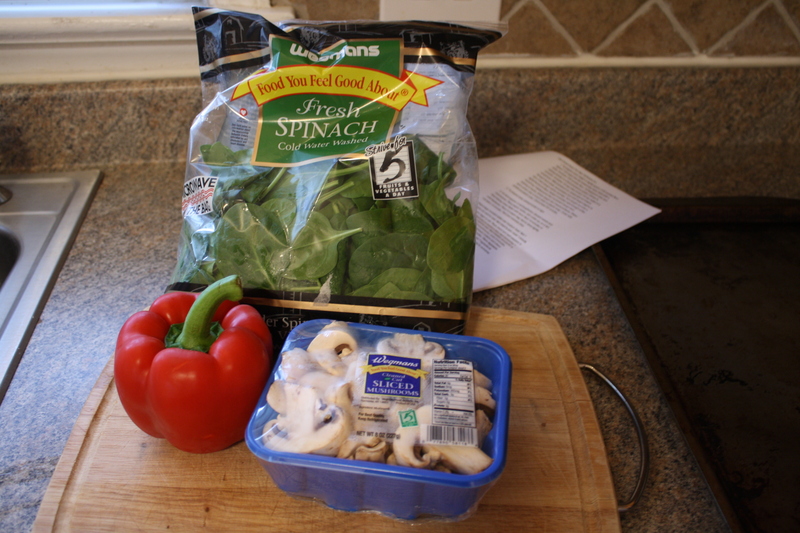 ), mushrooms, garlic, shallots and thyme—based on this Cooking Light recipe. But I only used half of the mixture because I was worried that otherwise the pie plate may overflow, so I’m planning to use the rest in omelets or quesadillas this week. This was also my first lattice top! 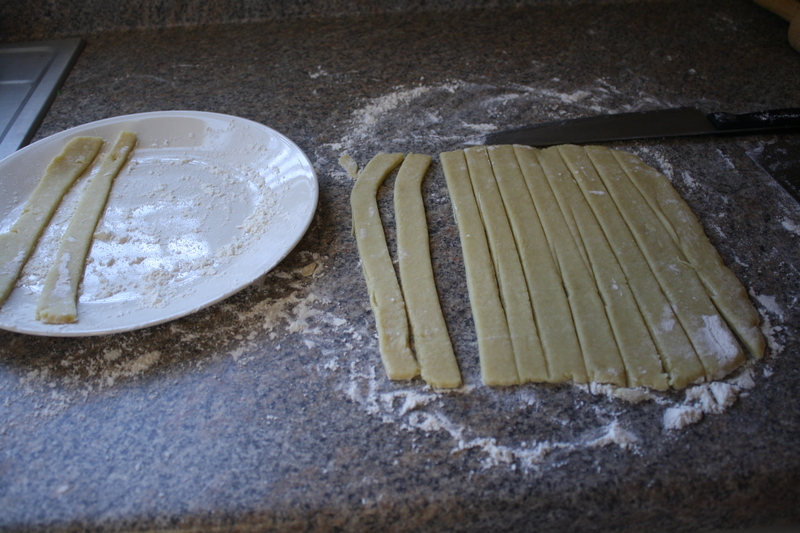 I wish I had a little crimpy roller thing to cut the pieces all pretty like in the picture in the cookbook. My mom thinks we had one in our Play-Doh toys when we were little. Perhaps I’ll look around for it to use for my next lattice top? And here are two interior photos—both version cut nice and smoothly after cooling for about an hour. Mmmm. Wow, delicious and creative. Thanks for sharing! Thanks! I wish I still had some for lunch today! Looks wonderful & very yummy! 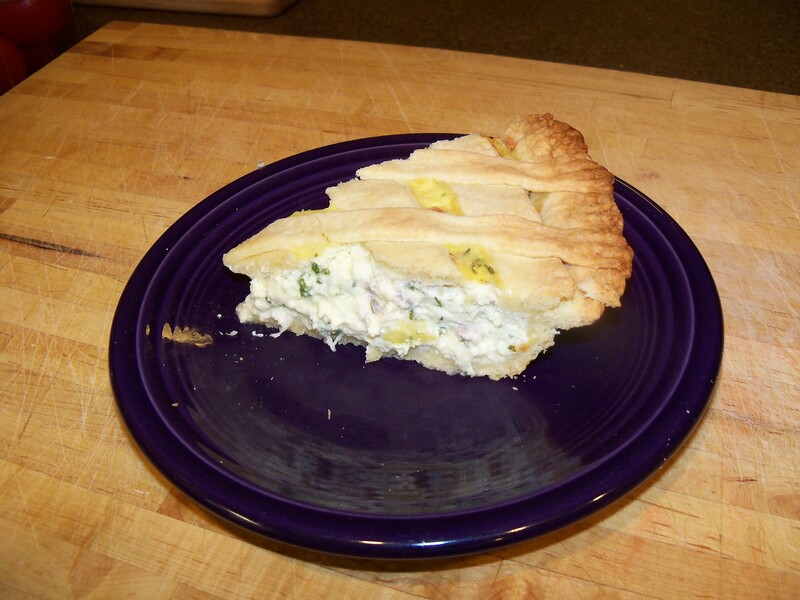 Though… next time I make a pie, I’ll probably convince myself that I need to go buy one! Your pizza looks great! It seems a lot of people had problems with the sweetness of the crust. Yours are so cute in the little tart pans too! It looks lovely – sounds like you had a lot of great things going on here. Good substitutions/additions. I wish I would have thought so creatively. Mine turned out bland..